“The Marchese Piero Antinori was one of the first to create a "Chianti-style" wine that ignored the DOC regulations, releasing a 1971 Sangiovese-Cabernet Sauvignon blend known as Tignanello in 1978. Other producers followed suit and soon the prices for these Super Tuscans were consistently beating the prices of some of most well known Chianti. Rather than rely on name recognition of the Chianti region, the Super Tuscan producers sought to create a wine brand that would be recognizable on its own merits by consumers. By the late 1980s, the trend of creating high quality non-DOC wines had spread to other regions of Tuscany, as well as Piedmont and Veneto. Modification to the Chianti DOC regulation attempted to ‘correct’ the issues of Super Tuscans, so that many of the original Super Tuscans would now qualify as standard DOC/G Chianti. While many producers have brought their Super Tuscans back under DOC regulations, many have not and instead continue to use the less restrictive IGT designation Toscana. PG: Sassicaia and Ornellaia are perhaps the most famous Super Tuscan Bordeaux blends. These are not cheap wines! Current vintages of both are selling for around $140 and up. Last night I enjoyed a comparable blend, from a very good vintage, at roughly one sixth the cost. 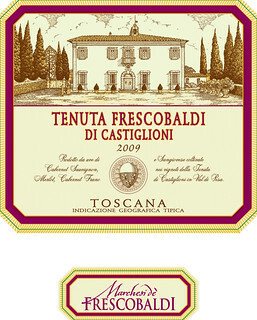 The 2009 Tenuta Frescobaldi di Castiglioni is 50% cabernet sauvignon, 30% merlot, 10% cabernet franc and 10% sangiovese. Full-bodied and supple, with lovely details of spice and tobacco, this generous and thoroughly delicious wine delivers far more flavor and pleasure than its humble price would suggest. In the large pantheon of releases from Frescobaldi, it is truly a standout.